Are you fed up with your members of Congress? Hey, take a number! And wait, because until they're up for re-election, which in the case of most senators isn't until 2012 or 2014, there's nothing you can do about it. Or is there? This week a three-judge appellate panel of the New Jersey Superior Court ruled in favor of the Committee to Recall Robert Menendez From the Office of U.S. Senator. The committee now has a green light to begin a recall drive for this November's ballot. Mr. Menendez, a Democrat, will almost certainly be able to serve out his term, which ends after the 2012 election. For one thing, getting a recall on the New Jersey ballot isn't easy, requiring the signatures of 25% of all registered voters. But the biggest obstacle is the U.S. Constitution. While states are free to permit voters to recall their own officials, as Californians famously did to Gov. Gray Davis in 2003, the qualifications and terms for federal officeholders are determined by the Constitution--in the case of senators, the 17th Amendment. In U.S. Term Limits v. Thornton (1995), the U.S. Supreme Court held that states may not impose qualifications for Congress beyond those set in the Constitution: age, residency and citizenship. That ruling was 5-4, but even the dissenters, led by Justice Clarence Thomas, rejected the idea of "a power of recall, which the Framers denied to the States when they specified the terms of Members of Congress." Thus if New Jerseyites voted to oust Mr. Menendez in a recall, he would be on rock-solid legal ground in claiming the right to remain in office. But depending on when the courts take up the constitutional question, he could find himself in an awkward political situation. The judges who ruled this week held that the constitutionality of a recall was not ripe for adjudication: "There is, and there will be, no necessity for our courts to resolve this . . . constitutional issue if the Committee's petition drive fails to collect the necessary, approximately, 1,300,000 signatures." Since New Jersey law expressly permits the recall of U.S. senators (as well as representatives), the petition drive will continue unless the New Jersey Supreme Court or the U.S. Supreme Court overturns this decision on appeal. But what if the ruling stands and the committee succeeds in collecting 1.3 million signatures? That in itself would amount to a vote of no confidence in Mr. Menendez, who received just over 1.2 million votes, or 53%, when he was elected in 2006. He could bring another legal challenge, and his chances of success would be better at that stage--but the courts could still conclude that there's no need to address the constitutional question before the recall vote has been held. Which brings up yet another interesting twist. As in California, the New Jersey law governing the recall of U.S. senators provides for a two-part ballot: Voters first cast a yes-or-no vote on the recall; then, whether or not they favor the recall, they choose a candidate to replace the officeholder if the recall succeeds. In California, however, the second part of the ballot is wide open, with one exception: The official being recalled may not appear. (Arnold Schwarzenegger beat 134 other candidates to succeed Mr. Davis.) In New Jersey, each party designates a nominee for the successor ballot, and the official being recalled is free to run to succeed himself. Additional candidates can qualify via petition. So if the recall made it to the ballot, what would the Democratic Party do? It could nominate Mr. Menendez, but if he accepted, it would lend political legitimacy to a constitutionally defective process. If he lost, he would be legally in the right in claiming that the recall had no force, but his opponents would portray such a challenge as sour grapes--and they would have a point. On the other hand, in a crowded field, it's possible that Mr. Menendez could lose the recall by a small majority but win a plurality in the election to succeed himself. The party could support Mr. Menendez by refusing to make a nomination, but that would ensure a GOP (or third-party) victory if the recall was successful. Or it could nominate someone else. New Jersey has elected Democrats in every U.S. Senate race since 1972. It's possible that voters would do so again even if they decide they've had it with Mr. Menendez. But in that case there would be two Democrats with a political claim to the seat. Mr. Menendez would have the winning legal claim, but if New Jersey voters are angry enough to throw him out of office early, he might feel politically obliged to resign. If he stayed the course, he'd surely have an uphill re-election fight in 2012. 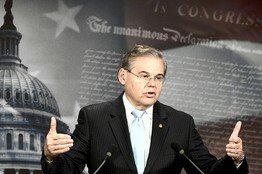 If voters approved a recall and chose a Democrat to succeed Mr. Menendez, a resignation would leave Gov. Chris Christie in an awkward position. Like the recall itself, the vote for a successor would have no legal force: The Constitution makes no provision for elections to fill vacancies that haven't yet occurred. Mr. Christie would have the legal authority to appoint the candidate of his choice, presumably a fellow Republican--but he might feel politically constrained to respect the voters' wishes. Alternatively, under New Jersey law, Mr. Christie could call a special election to fill the remainder of the term. For the sake of the Garden State's dignity, the best outcome would be a court ruling that shuts down this circus sooner rather than later. But those of us who enjoy a good political circus will be rooting for the show to go on.